The Secure Login is an easy handy plugin, for the popular Ultimate Client Manager, which can add an extra security layer to your login procedure. The plugin is now compatible with Metis, WhileLabel, Pro and AdminLTE themes, but it will be available also with Blocks theme soon. 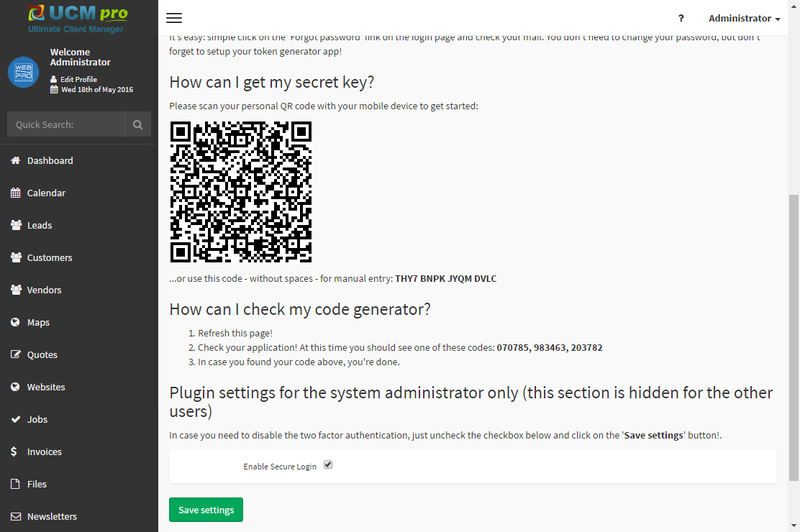 To use the plugin you need a mobile device (phone or tablet) on which you have to install a token generator application. For more information please read the Features point. The Ultimate Client Manager can be found here. [ First release ] UCM Plugin: Secure Login v1.0. WARNING: Please read the Installation Instructions! In case of emergency (you can see blank page only or get unknown error messages) simply delete the Secure Login plugin folder and contact with me. I’ll try to help ASAP. This is a plugin for the Ultimate Client Manager. Please ensure the latest version of Ultimate Client Manager (Lite or Pro) has been purchased and installed before using this plugin. 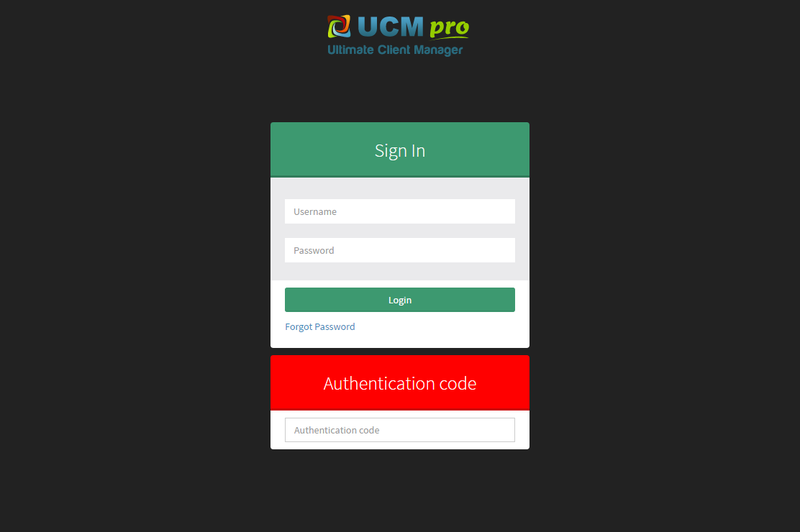 I’m not the developer of the Ultimate Client Manager, please click on the link to get information about UCM support. Please, refrain from downloading codes from unreliable sources, because by doing this you ignore the hard work of the developers! The Two-Factor Authentication is an option that adds an extra layer of security to your Ultimate Client Manager account. Here’s how two-factor authentication works: To be simple, when you login you have to enter your Username, Password. But if you enabled this extra security layer, after you enter your email and password, we will also require that you supply an additional one-time use token that is updated every 30 seconds automatically. We recommend using the Google Authenticator app, which is available for both Android, Apple and Blackberry devices as the preferred app for generating these tokens for your account. No internet connection is required for the tokens to be generated. I lost my phone. How can I login? It’s easy: simple click on the ‘Forgot password’ link on the login page and check your mail. You don’t need to change your password, but don’t forget to setup your token generator app! How can I get my secret key? Please scan your personal QR code with your mobile device to get started on the Settings / Secure Login page …or use the code – without spaces – for manual entry. That’s it! Enjoy! If you need more information about my plugins follow me on Youtube (https://www.youtube.com/user/webNpro)! If you feel that I have not asked for sufficient payment for one of my works, I will gladly accept your extra offerings. If you want to support one of my works, you can order it more than once. You can also send your individual donations to my PayPal account via paypal@webnpro.hu, it will be greatly appreciated. You can email me if you need help regarding any of my products (support@webnpro.com) or via the „Support” page on the product’s profile page. I’d be glad to help you if you have any questions in relation to my items. No guarantees, but I’ll do my best to assist. I live and work in Hungary, so you can communicate with me in Hungarian or English, but my knowledge of the latter is far from perfect. Please, visit my website at http://webnpro.com, follow me on Twitter (@webnprocom) or Facebook (http://facebook.com/webnpro) or Youtube (https://www.youtube.com/user/webNpro)! I am looking forward to count you among my customers soon! From the v1.0 version the plugin has a new automatically upgrade function too, what you can find at the Settings / Secure Login menu point. With its help you can foremost test the new functions and faster reach the contingent repairs too. For more information please read the Automatically upgrade function feature documentation. The Secure Editor of course can upgrade by the traditional download-upload-manual upgrade way too, for this just follow the Installation Instructions. To finishing the installation choose the Settings > Upgrade menu point, and click on the Manual Upgrade button. 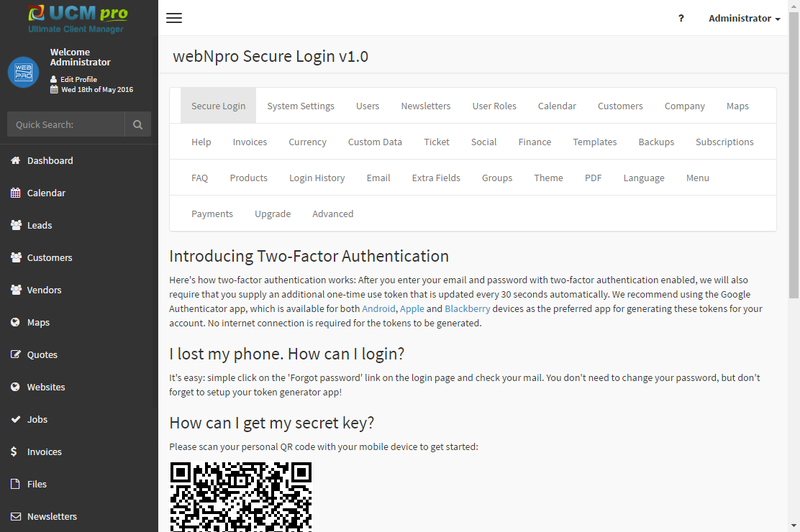 If you see All Good title on the end of webNpro Secure Login plugin’s line the plugin installation is successful. To be able to use the Two-Factor Authentication you have to set a token generator upon the first login in the following menu: Settings > Secure Login. From the v1.0 version the plugin has a new automatically upgrade function too, what you can find at the Settings / Secure Login menu point. With its help you can foremost test the new functions and faster reach the contingent repairs too. This function check and do only the Secure Login plugin’s upgrades, the UCM’s and the other plugin’s upgrade not!